His hands gripped the steering wheel as he cut his eyes off the road to fix them on mine. “The tape.” I didn’t have to wonder what Frisner was talking about. 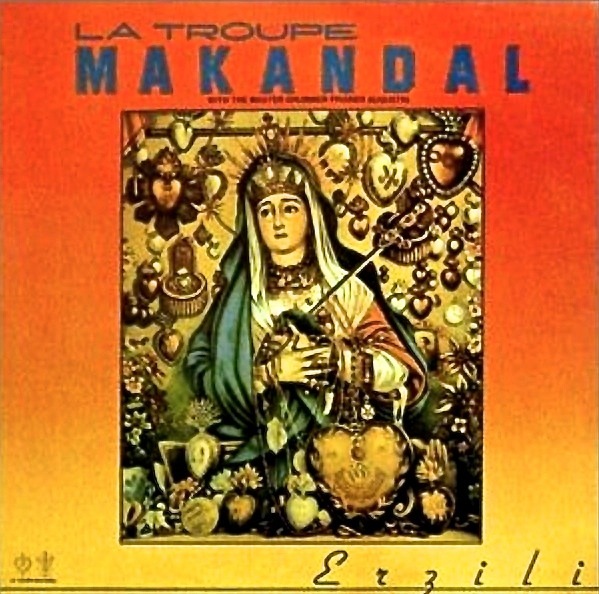 In the summer of 1986 Makandal had been hard at work in rehearsal and then the studio to make its second music album, Erzili. Together with audio engineer Harry Leroy, we had finished both recording and mixing. Although it was customary to leave the master tape with the engineer, Frisner had insisted on taking home both the pre-mix (with tracks separated) and the final stereo mix. He stored them on a high—almost to the ceiling—shelf in the bedroom. I had just passed through that room before going out to find Frisner and break the disquieting news that half our apartment—including the bedroom—had gone up in flames while we were both away. I came home to the disaster first, and when it was safe, I toured the charred chaos. The pungent odor of smoke, and images of belongings scorched beyond recognition, filled my senses now as I struggled to remember. Yes, the tape. What had become of Erzili? In 1986 we were living at 189 St. Marks Avenue in the Prospect Heights neighborhood of Brooklyn. I recall how the mother of our Haitian landlady raced up and down the halls on February 7 screaming, “Duvalier ale!” (“Duvalier is gone!”) Baby Doc had fled Haiti. We played two community events that spring, one focusing on the changes in Haiti. We also landed our first engagement with World Music Institute (the subject of a previous post). The United States meanwhile celebrated the centennial of the Statue of Liberty, an occasion that won us a contract to play three days straight through the Fourth of July weekend at Battery Park. 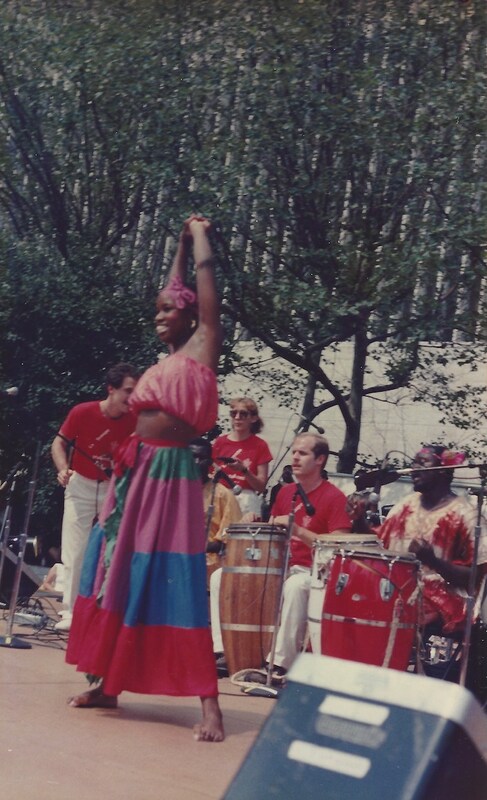 On Sunday, August 10, the Caribbean Cultural Center presented us in Damrosch Park along with eleven other groups at Lincoln Center Out-of-Doors’ Caribbean Music Day—where we beat the drums (see photo above) on instruments that would perish in fire the next day. Through it all, Frisner planned his Erzili LP album (see cover to the right). Using personal resources, with help from Harry Leroy and producer Joel Pierre, he organized an ensemble of his own band plus a new crop of dancers that choreographer Joel Désir had brought into Makandal. The dancers would provide vocals. With seven songs totaling thirty-nine minutes, Erzili showcased Frisner’s adventures in Vodou jazz. The artists’ list tells part of the story: Frisner Augustin, master drum, lead vocal; Steve Deats, second drum; Steve White, third drum; Paul Newman, percussion; Harry Leroy, synthesizer; Jacques François, trumpet; Tim Newman, trombone; Christopher Zimmerman, tenor sax; Danny Pera, bass; and Janine Brillant, Joel Désir, Loving Desrosiers, Josette Foreste, Maggie Foreste, Thirtsa Foreste, Jean Paul Joseph, and Ermilia Mardy, vocals. The excerpt below from the song “Ayizan” (track 2) tells it in sound. Hear German-born Chris Zimmerman’s spirited solo for sax. It should be evident now that through some feat of magic, the Erzili tape escaped the flames. As soon as we arrived at our lost digs—we moved out by the end of the week—Frisner recovered both tapes from the shelf near the ceiling. The final mix, sitting on top of the heavy box that held the pre-mix, had melted like a giant chocolate drop in a sultry sun. We found the pre-mix intact and returned it to Leroy for re-mixing. Perhaps her affinity for water saved Èzili Freda that day. An imposing statue representing her sister, fire queen Èzili Dantò, served as centerpiece on Frisner’s Vodou altar in the next room. We found no trace of the statue. But then, she was in her element. And the darling of our next album was in hers. Stories like this are emerging from the Frisner Augustin Memorial Archive. Please help us continue the storytelling with a tax-deductible contribution. Many thanks for working with Makandal to bridge the past and the future of traditional Haitian arts. Featured image: Collage by Lois Wilcken, using traditional images for Èzili Dantò (left) and Èzili Freda Dawomen. This entry was posted in Tales from the Archive, Vodou and tagged Archive, Drumming, Drums, Frisner Augustin, Haiti, Haitian, Haitian Music, Vodou. Bookmark the permalink.